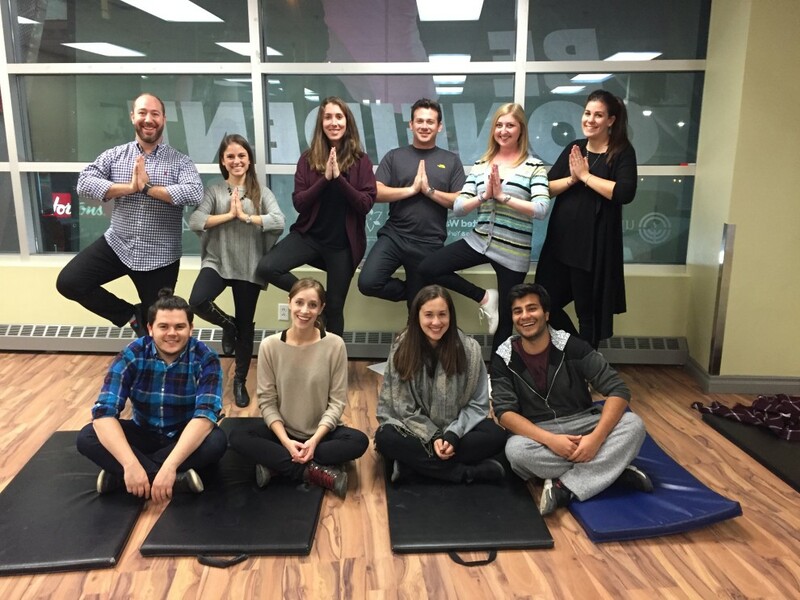 On Monday, November 28th, young adults came together to "Relax, Renew, and Refresh." This event was created through the UJA Young Leaders Madrichim in Training (MIT) Program for Birthright Israel trips with Canada Israel Experience. The MIT program provides young adults the opportunity to develop their leadership skills and become role models and active members of the Toronto Jewish Community. As part of this program, MITs have the opportunity to make a difference Jewish Toronto through Impact Projects that engage young adults in various aspects of Judaism and Israel. Moreover, Impact Projects introduce young adults to the vast amount of opportunities and resources that the Jewish community has to offer. With a focus on Mental Health, Relax, Renew, Refresh was developed to explore how mindfulness, meditation, and CBT can help reduce the symptoms of stress and anxiety that many of us encounter in daily life. The event was located at the Miles Nadal Jewish Community Centre (MNJCC), a state of the art Fitness Center and community space. The MNJCC provides opportunities for people of all ages and backgrounds to be active, learn, connect and participate in a wide range of cultural experiences. Under the guidance of Michelle Katz, certified Iyengar Yoga Therapist, Jewish Director, and Educator, attendees were introduced to mindfulness techniques and learned how to incorporate them into everyday life. Unbeknownst to many, Michelle also explained how Jewish thought has informed the practice of meditation and how. These techniques are valuable for everyday life as it lets us take as step back and focus on our body and mind. Attendees also learned about Jewish Family & Child and the services they offer from Danielle Rovinsky, Counselling Social Worker. Jewish Family & Child supports the healthy development of individuals, children, families, and communities through prevention, protection, counseling, education and advocacy services, within the context of Jewish values. Danielle provided attendees with some fantastic stress management techniques to bring focus to one's emotions, thoughts, and behaviors. The Cognitive-behavioral model was another alternative to mindfulness and overall mental health. This event could not have taken place without the hard work of the incredible team through UJA Young Leaders' MIT Program - MITs Raye Oscar, Zach Ellis, Lauren Klar, Katherine Fogler; mentors Daniel Prupas and Lilli Greenspoon; co-chair Anna Frankel; and UJA staff Jessica Taylor, Sam Walman and Witnee Karp.